Another issue of outgoing mayor Spinello was his Industrial Development Agency (IDA) gave tax breaks to companies such as RXR, which will cost Glen Cove in the years to come if revoked $90 million. Under the Ralph Suozzi administration his IDA appointments gave the Regency a 40-year tax exemption, which means they do not pay taxes. Based on the IDA’s tax giveaways, I wonder how this benefits the City of Glen Cove considering that these are luxury apartments, and only 10 percent would be reserved for affordable units. I was in attendance at a city council meeting when out of town employees from a local union packed the meeting. How again is this for economic development when they do not pay taxes and all of those employees do not live in Glen Cove? The current Spinello administration relied too much on building and construction permits to balance the budget which the New York State Comptroller in his reports stated that this was not a fiscally sound way to foresee future budgets, and this could result in possible shortcomings. The voters were not uninformed; they were just unenthused about the candidates. I find Mr. Levy’s comment about voter ignorance an insult to the voters’ (including myself ) intelligence. In response to Mr. Levy’s analogy about being satisfied with Spinello, I would like to know how he conducted this survey. It takes a professional pollster to do random samplings. 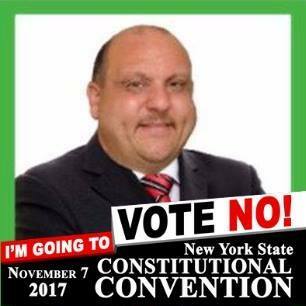 This Tuesday, Election Day, when you go to vote for me (and all the other Green Party candidates on the ballot), don’t forget to turn the ballot over and vote “No” on the proposition question of the call for a constitutional convention. While this may seem like a positive pro-active idea, the process for electing delegates is as subject to money and influence as the election system in general. “First, if this proposal were to pass the convention would cost hundreds of millions of dollars including a minimum salary of $79,500 for each of 204 delegates for a total minimum salary cost of $16,218,000. Second, these delegates would be elected after running for these seats in the ConCon. Corporations and other special interests could spend millions to have their lobbyists elected to the ConCon. Third, Albany insiders, politicians and their families could double-dip on their salary and pensions. Each delegate would receive pension credit. although proponents of this proposal say pensions are safe from meddling by these delegates because they are contracts and protected by the US Constitution, if the ConCon nevertheless makes changes to the pension system someone would have to take it to court to declare the change unconstitutional. Pensioners would hope the court sees it their way. the “forever wild” provision of the NYS Constitution, creating the Adirondack Park, could be changed or abolished. access to a quality public education is currently guaranteed by the state constitution. election and voting rights are currently protected in our state constitution. The last constitutional convention produced proposals for amendments to the state constitution. The voters rejected all of them. New York State already has a legislative process to amend the state constitution which doesn’t cost the taxpayers anything. I am a lifelong resident of the City of Glen Cove. I would like to rescind any decision the Glen Cove Industrial Development Agency (IDA) has made pertaining to property tax exemptions. I would also abolish the Industrial Development Agency (IDA). This is a form of corporate welfare, which does not benefit the residents of the City of Glen Cove. It is unfair for Glen Cove residents to pay for these projects that developers should pay for. I would also like to address the lack of affordable housing in Glen Cove. The City of Glen Cove has approved many projects for luxury apartments and only left aside 10 percent for affordable units. These units set aside are not affordable. They are based on a gross income of 80-130% above the federal poverty rate. This is based on 30 percent of your total gross income. How could a person that makes above federal poverty rate wages afford to pay a base rate of 30% of their total gross income. I would require that this be based no more than 20% of your net income. Long time Glen Cove residents have been displaced from their homes and forced out of Glen Cove due to market rate rents. Rescind any Industrial Development Agency (IDA) decisions and abolish the Glen Cove IDA. Establish local affordable housing units based on net income not gross income. Stop the over development of Glen Cove. I.E. The waterfront, and down town luxury apartments. build a trust in the immigrant community legal or not. The immigrant community should not have to report a crime out of fear of deportation. I would like to thank my supporters for helping me get the 609 votes for the 13th Assembly District. This was a record set considering the amount of money I put into my campaign. I would like to thank Carl Lungren for setting up the website and assisting me with blogs and information about candidates forums. I would also like to thank Bruce Levy from Plainview for his assistance in leafleting in Plainview and also Steve Abreau( PEL) club president at SUNY Old Westbury for his interview and his assistance and also in leafleting in Plainview for me. I would also like to thank Frank Francois for picking up my literature for me. I would lie to thank my family and friends financially supporting me to get my literature and publicity together. If I have left anyone out I apologize. Thank you and I will run again to win this time. Jeff Peress has run for the 13th State Assembly district seat four times, and lost each one. This time will be no different, he said. Peress said past defeats exemplify his longstanding commitment to progressive principles, no matter their electoral consequences. The Green Party nominee called himself the most left wing candidate in a race that includes Charles Lavine, a six-term Democratic incumbent, and Jeff Vitale, a Republican running in his first campaign for office. The district covers Roslyn, Glen Cove, Jericho and Plainview as well as parts of Manhasset, Westbury, East Hills and Bayville. Peress currently works as a custodian and attends SUNY Old Westbury where he is working on an undergraduate degree in sociology. 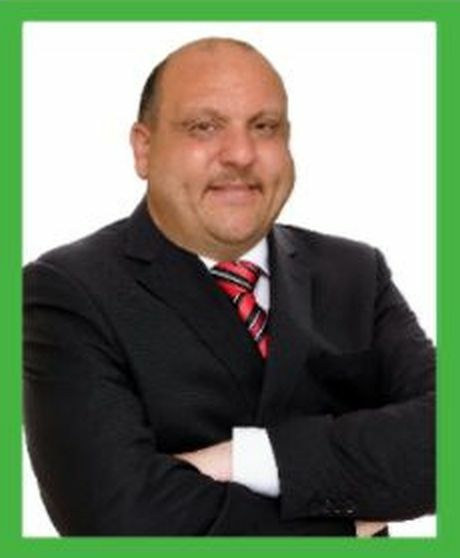 His most recent race came in September 2015, when he ran in a primary for the 11th legislative district of Nassau County, which he lost to Democrat Delia DeRiggi-Whitton, who received write-in votes from registered Green Party voters. In an interview with Blank Slate Media, Peress proposed a plan to raise taxes on the incomes of the top 5 percent of earners and institute a financial transaction tax to pay for the expansion of Section 8 housing, the elimination of tuition at all CUNY and SUNY schools, and the implementation of single payer health care. He also called for a reduction in both property taxes and the state portion of the sales tax. Peress drew sharp contrasts between himself and the Democratic candidate, Lavine, on issues ranging from the minimum wage to criminal justice to boycott, divestment, and sanctions on Israel. Peress supports a $15 per hour wage floor in New York State, but said the minimum wage should be $22 per hour in Long Island and $20 per hour in New York City, based on the relatively high cost of living in both places. Lavine supports a statewide minimum wage of $15 per hour. Vitale would like a $15 minimum wage in New York City and a potential raise to that rate upstate, depending on the results of the increase in New York City. One of Peress’ central issues is the unfair denial of suffrage to those serving parole for past misdemeanors or felonies. “They pay taxes,” he said. The son of an Iraqi Jew who gained refugee status in Israel, Peress is a strong proponent of boycott, divestment, and sanctions on the country. BDS became a hot topic in the state legislature in January, when Lavine and other members sponsored a bill that sought the denial of state contracts and investments from the state pension fund to companies that boycott Israel. Gov. Andrew Cuomo later signed an executive order that directs state agencies to stop doing business with any institution or company that supports BDS, which Lavine supported. “I don’t believe the United States should be enabling or helping corporations that want to undermine the only democracy in the Middle East,” Lavine said. Peress and Lavine agree on many issues, including their support for single payer health care, a full-time legislature, publicly financed elections, and closing the LLC loophole, which allows one entity to make multiple political donations through different corporations. Over the campaign, Green Party presidential candidate Jill Stein has gained attention for comments she made that raise doubts about the reliability of vaccines in combatting disease. Another of Stein’s notable remarks portrayed Democratic presidential nominee Hillary Clinton as a more dangerous prospective president than her Republican counterpart, Donald Trump. Peress expressed agreement with his party’s presidential nominee, saying Clinton’s proposed no-fly zone over Syria could very well escalate that conflict into a war with Russia. Peress suggested that Trump’s lack of foreign policy background suggests he may prove more restrained than Clinton. Peress ran for the Assembly seat in 2000, 2002, 2012, and 2014. He received 395 votes in 2012 and 389 votes in 2014; both results comprised approximately 1 percent of the electorate. In light of the indictments of elected county and town officials in Oyster Bay both the legislatures have not gone far enough to stamp out corruption. Unfortunately, the causes are from pay to play and kickbacks from campaign contributions. The recent law passed that any elected official convicted of corruption relating to their positions does not go far enough. The recent convictions of Silver and Skelos, unfortunately, are going to be overturned based on the recent US Supreme Court decision that overturned the former governor of Virginia’s corruption conviction. The unanimous decision made by the US Supreme Court made it more difficult to charge, yet alone convict someone of corruption. The only way to restore the confidence in NY politics is to, use the Arizona and Maine model Clean Money / Clean Elections of no private funds for candidates. These funds are to be public only, and also to push for ranked choice voting and instant run off voting. I want to wish a belated birthday greeting to our Green Party VP candidate Ajamu Baraka, whose birthday was October 25th: Mazel tov. I would like to wish everyone a La Shana Tova 5777. Happy and healthy New Year and let this new year be with peace, justice, and prosperity for our fellow working class people around the world. Let all the hate turn to coming together. Lets hope this will be the year finally that Israelis and Palestinians will come to the table and talk and resolve all past and current disputes and work together for the good of all and be partners together for the working class. Jeff was one of the participants at the Harlem Rally for Justice on 125th St. And Adam Clayton Powell Jr. Blvd. this past Sunday. 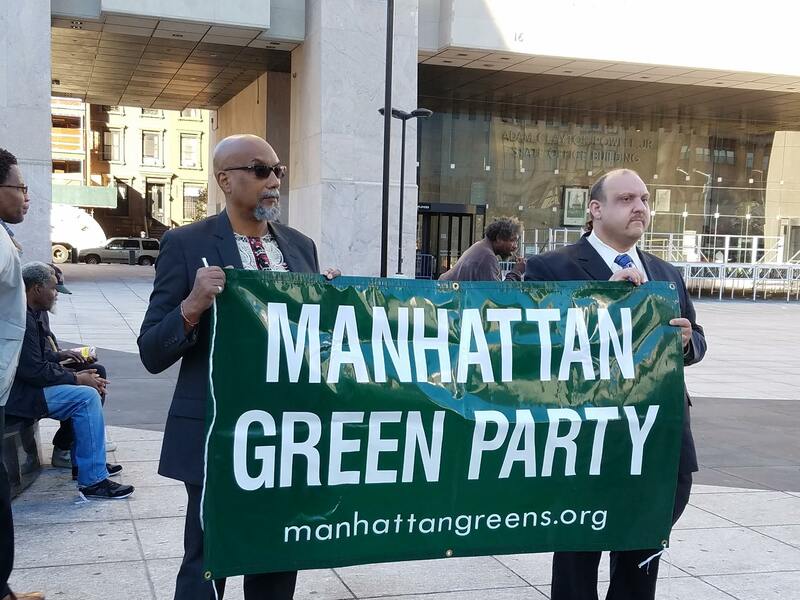 The rally, organized by Manhattan Greens, included Green Party Vice presidential candidate Ajamu Baraka, Congressional candidates Frank Francois (CD5 Queens/Nassau County) and Daniel Vila (CD13 Manhattan/Bronx), and State Senate candidate Julia Willebrand (SD31 Manhattan), as well as community activists Betty Davis and Ed Figueroa. Enter your email address to follow our campaign and receive notifications of new posts by email.